I was fascinated with the whole process. It began with browsing tiny model homes just as you would a builder’s spec model home to decide between a standard or customized tiny home. They decided to customize their home and I watched it unfold from there. Construction began with framing of the trailer with 2×2’s rather than 2×4’s to save on space and weight and then wrapping the home to provide an air and water barrier. Next, came all the fun space-saving necessities. The home had a 13 ft. vaulted ceiling in which they utilized by creating a cozy loft with a very thin full size mattress. Again, I had thoughts of sharing a bed with only a full size mattress, I’m fairly certain I couldn’t make that work, however, they did a beautiful job of utilizing every nook and cranny. They both had very narrow nightstands with overhead ceiling lighting and used remaining wall space to hang other items. They customized the loft in their tiny house by having an actual staircase built rather than a ladder because they had a small dog. In doing this, they actually gained more usable space downstairs by having a wall that provided additional kitchen counter space and more room for their wall mounted flat-screen television. Did I mention this couple was in their 20’s? To be young and in love and with your spouse e-v-e-r-y minute of every day. The main living area featured beautiful wood floors, a cozy area for watching TV, gas stove for cooking, kitchen sink, a small bath with rain shower which included a small, square tub insert for their dog, and a miniature wood stove as well as a propane heater. The whole idea is just genius and cost effective. 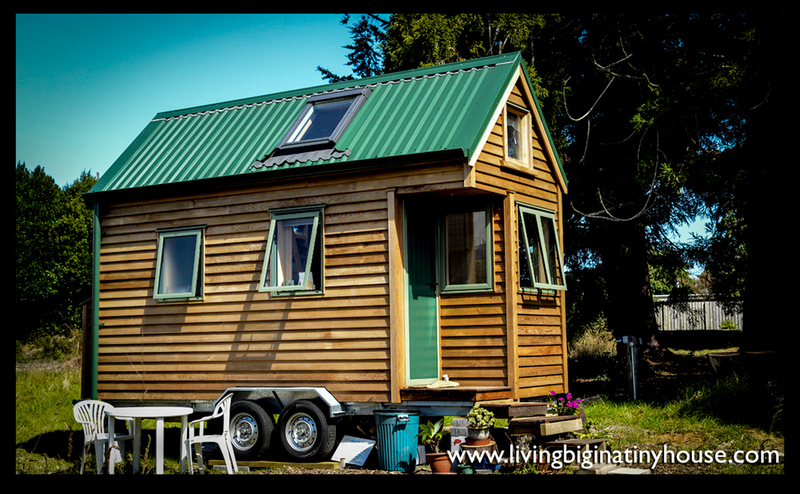 In the end, they ended up with a beautiful, custom, cedar, 7,000 lb tiny house that they were able to tow across the US, even through the streets of NYC and Central Park before they settled on a farm in Colorado. And for the cost of $199 sq. ft and no mortgage, why not? 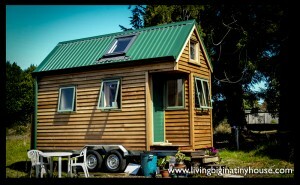 What do you think of living in a tiny house? Could you downsize and live a simple life? Please share your thoughts below.